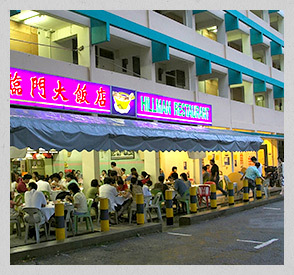 Hillman Restaurant was founded in 1963 by our founder, Mr. Wong Ling Onn and co-founder Madam Chan Ah Chee at Blk 1, Cantonment Road. Located at one of the earliest HDB project in Singapore; the restaurant was popular with office crowd from Port of Singapore Authority, Shenton Way and doctors and nurses from Singapore General Hospital. The building is now being replaced by the Pinnacle at Duxton, the first Sky-Garden HDB project in Singapore, and our restaurant has since, in 2003, moved to No. 135 Kitchener Road; operating in a conservation Shophouse. It has first and second floors with a seating capacity of about 130 persons. To provide a traditional home-cook and Zi-char (roadside hawker) flavor in a simple but comfortable environment. 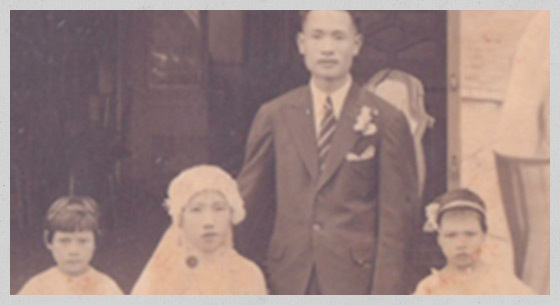 Mr. Wong Ling Onn and Madam Chan Ah Chee first arrived in Singapore in early 1930s as migrant workers from China, Guandong Province. Mr. Wong and Madam Chan later got married in Singapore and had 9 children from the marriage. Mr. Wong operated 3 restaurants namely, Fong Seng at Jalan Besar, Yow Kee at Bugis Street, and Sun Sang restaurant inside Great World Amusement Park at Kim Seng Road. The World War II broke out not long after that, and with the Japanese invasion in 1942, Mr. Wong returned to China but Madam Chan remained in Singapore with the rest of the family; faced with a big family to feed, she set up a hawker stall along Jalan Besar road selling Roast Duck and Char Siew rice; enjoying a brisk business and providing a livelihood for the big family throughout the war. After the war ended, Mr. Wong returned to Singapore and he set up a hawker stall in Chinatown Smith Street selling cook-to-order Chee Cheong Fun (stuffed rice roll with char siew, liver and prawns, etc.). He was nicknamed the “Gou Loh Wong” (The Tall Wong) in Chinatown. He opened the first Hillman Restaurant in 1963, situated along Cantonment Road, serving Cantonese Claypot cuisines which he had mastered in his ShunTak (Guangdong Province) hometown. Cooking in a Claypot is an alternative way of cooking, besides using the wok(kuali); the temperature of the food is being kept warm in the Claypot for an extended period of time, making it suitable for consumption during the cold winter in Guangdong. On top of that , the flavor of the food is retained in the porous walls of the claypot, seasoning the claypots each time a meal is cooked. The more seasoned a pot is, the better the flavor of the food will be produced. 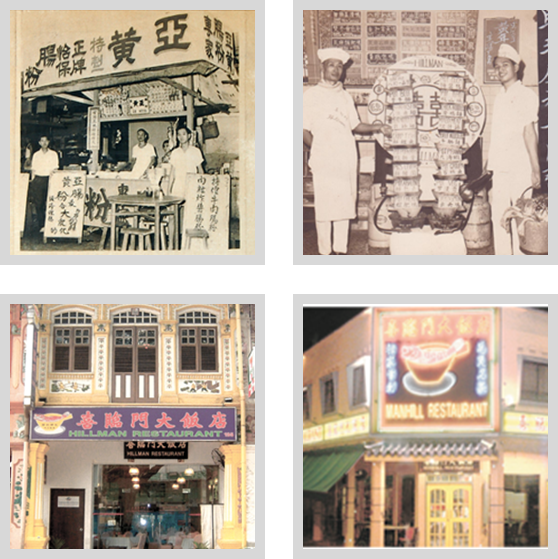 The restaurant proved to be a hit with the locals as well as the foreign expatriates; and 10 years later, in 1973, Mr. Wong and his family opened a branch restaurant, Manhill Restaurant at 99, Pasir Panjang Road. Then in 1995, a third Hillman Seafood Garden was opened at Albert Court Hotel. His sons, Sang Kiong, kwok kiong took charge of the kitchens of Hillman and Manhill, while his daughters Kit Sum,Teng Sum and Chai Sum, son Mun Keon and his wife Madam Ho Siow Ying, helped out with the service and waitering. The big break came in 1978, when our restaurant was invited to participate in the first Asian Salon Culinaire, which is the equivalent of today’s World Gourmet Challenge (Food and Hotel Asia); held in the then Hyatt Hotel. The Chief Judge of the competition was Mr. Paul Bocuse, the legendary French Chef who has a medal of Commdeur de la d’honneur (National Order of the Legion of Honour) and the Meilleur Ouvier de France (The best food craftsman of his lifetime); and he owns a 3 Michelin stars restaurant in Lyon, France. Our restaurant won a gold medal for the Boneless Chicken Dish, a Silver for Claypot Prawns, and a bronze for the Cold dish. 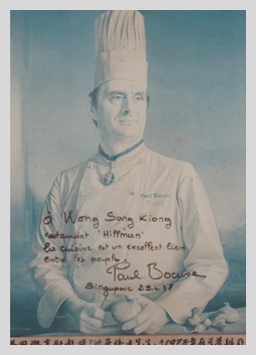 It was a moment of glory and achievement for Mr. Wong, and we were honored to have Mr. Bocuse dining at our restaurant; after which he presented Mr. Wong Sang Kiong a signed picture of himself, quoting in French: Excellent cuisine and good relationship between the food and the people. During 1984, the 2nd generation Mr. Wong Sang Kiong was invited to represent Singapore in the International Master Chef of Chinese Cuisine Competition held in China. He was awarded a Silver Medal for his Special Coconut Chicken Dish. Mr. Wong Ling Onn later went into retirement and handed the day to day running of the business to his sons and daughters. He passed away in 1996 at the age of 85 and his wife, Madam Chan, passed away in 2008 at the age of 96. The restaurant operations are now being managed by Sang Kiong, Kwok Kiong, Teng Sum and Madam Ho; and the 3rd generation joining the business is grandson Richard Wong. After operating for more than 40 years, the main restaurant at Cantonment Road was earmarked by the government for re-development project and we had no choice but to move in August 2003, to our present location at No. 135 Kitchener Road; ironically, it was where the late Madam Chan started her roadside hawking days during the early 1940s. It was in 2008 that our restaurant has achieved a milestone when we were awarded the prestigious World Famous Restaurant by the World Association of Chinese Cuisine. Today, the restaurant has been through major changes and the new restaurant at Kitchener Road has a cleaner environment with air-conditioning, and we hope to continue the taste and the traditions for as many generations as we can.